New York, November 6, 2017– It’s Coming! 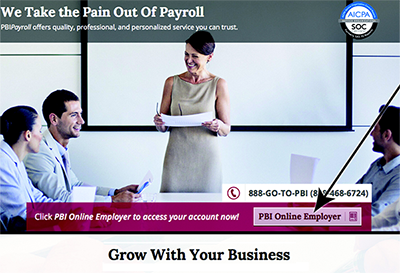 PBIPayroll Inc. is delighted to preview the launch of our updated website PBIPayroll.com. It is fully branded and full of features such as clear navigation, in-depth descriptions of all services, a wide-ranging online resource database, and ease of use. PBIPayroll customer, Anne Conte of Dickard Widder, agrees. An award winning company, PBIPayroll Inc. is a private payroll processing and HR company, working closely with companies nationally providing resources to help them grow their business. At PBIPayroll this means our company has been structured to handle all of your requirements including personalized and cost relationship options. If you would like more information about this topic, please contact info@PBIPayroll.com.